Everybody who is living the normal life knows that all food prices are going up every year. So far inflation was exported to emerging markets and places like China with strict management of its currency valuation. Jim Rickards has explained it in the great detail in his book: Currency Wars. Now after The Currency Wars we are entering The Financial Wars. China has already cut its US Treasury holdings most since 2011 and bought the record amount of Gold. Watch Yuan to go higher now. The great inflation episode can be much closer than a lot of people think. Rising velocity of money will push inflation back into the Western system and Gold already smells that it is coming with its recent breakout. China Cuts Treasury Holding Most Since 2011 Amid Taper. "The future will show who is right, but it is very encouraging that despite the very strong move up in Gold there is still record bearishness towards this sector among investors. This is how all Bull markets have started and this New Gold Bull Leg will be no different. Gold is pushing $1230 level today and Silver is looking at the $22.00 level. US dollar is dangerously close to 80.00 level again, which supposed to be protected. Peter Schiff: "Janet Yellen said that she wants more inflation - she will get it." "We are following Toby Connor with his very interesting concept of The Great Inflation in 2014. Gold was in a breakout mood this week and finally has broken to the upside from $1270 level with intraday high on Friday at $1,322 and close at $1,319. We have now the massive short squeeze in action in Gold and Silver. Silver has broken to the upside as well on Friday closing at $21.51. Gold mining shares are making the very good progress as well. On the chart above you can see that Gold has crossed the very important level on daily chart and moved above its 200MA at $1,309. It will bring a lot of attention of traders and shorts will be running to the exit now. Mass media will be picking up the Gold story as well now. 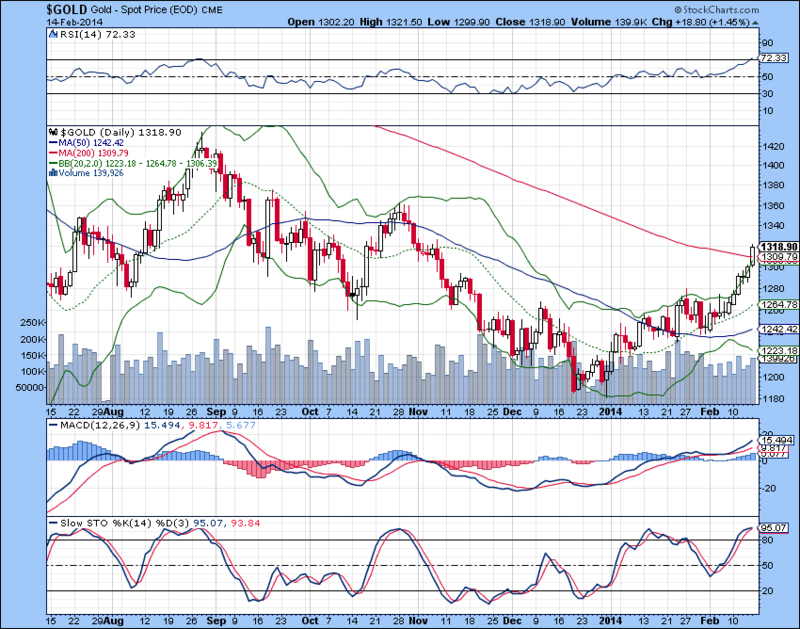 CNBC is talking about Gold and Miners already and Jim Cramer advises to watch GDX - Gold miners ETF. Next levels in Gold to watch is $1,360 and $1,420 to complete Double Bottom Reversal pattern on weekly chart. Silver had its massive breakout as well following the Gold footsteps this week. Next levels to watch here are $22.75 and $25 to confirm its Double Bottom Reversal pattern on weekly chart. 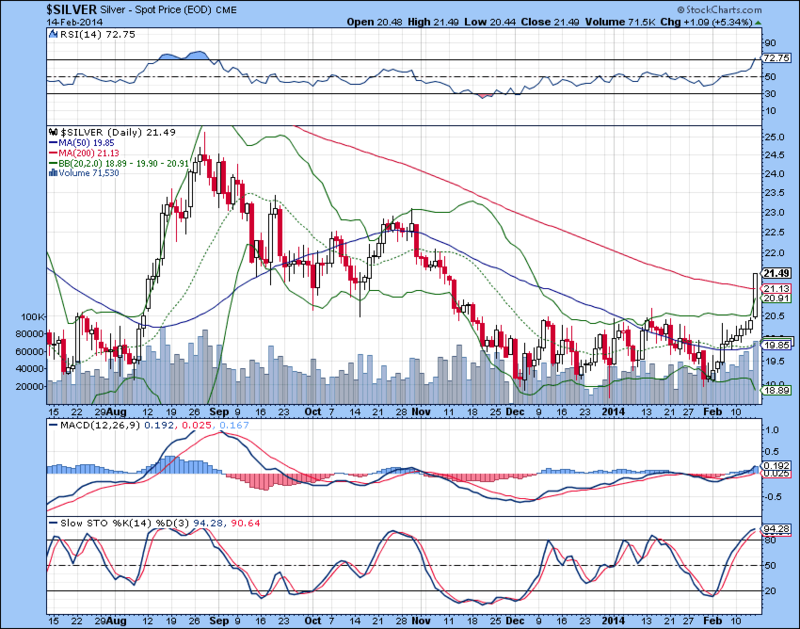 The most important here that Silver has broken to the upside above its 200MA at $21.13 and closed above it at $21.49." "Gold is sending its Happy Valentines to all Gold Bugs today and breaks $1320 on the massive short squeeze. Gold shorts will have their Blood Friday now. The real reason for this move is the realisation of the groundbreaking shift in the structure of the Gold market with the unprecedented demand of 2,181 tons of Gold from China in 2013. Janet Yellen testimony has opened the possibility To Taper The Taper and James Rickards is calling for the Taper Pause in June. US dollar is going down very close to 80.00 level again. This level will be protected, but should the US Dollar break down below 80.00 Gold and Silver will go vertical towards $1,500 and $25 respectively. Our short Squeeze watch includes McEwen Mining and TNR Gold. McEwen Mining had 26.8 million shares sold short or 8.6 days to cover, according to NASDAQ. MUX.to has rocketed from December low of CAD1.80 to CAD3.27 close yesterday. Gold breakout will push shorts into the corner, but explosive move in Silver will have even more effect on this company. TNR Gold is still day dreaming, but move in McEwen Mining should pull out this junior out of its misery. Los Azules Copper development will be next to watch on the back of recent M&A activity in the sector and CRB - commodity index breakout to the upside."